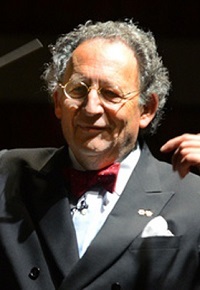 Symphony Conductor and Motivational Speaker Boris Brott’s interactive presentation has entertained and informed thousands of people in Fortune 500 companies throughout the world. He draws clearly accurate comparisons of Leadership, Teamwork, Innovation, and Creativity between business organizations and symphony orchestras. Boris draws out the juxtaposition of teamwork and leadership the need for creativity within an organization; the joy of communication and the achievement of success. All are explored through the medium of music. Currently, Boris is Conductor and Music Director of the New West Symphony in California, the McGill Chamber Orchestra in Montreal, Canada, the National Academy Orchestra of Canada and Principal Youth and Family Conductor of the National Arts Center of Canada. He is also Artistic Director of the Brott Musical Festivals, Ontario’s principal classical orchestra music festival. Internationally, Boris has served as Assistant Conductor to the New York Philharmonic under the late Leonard Bernstein, Music Director and Conductor for the Royal Ballet, Covent Garden, Chief Conductor of the BBC National Symphony of Wales and Music Director of the Northern Sinfonia of England. His extensive guest-conducting appearances have been around the world. In 2000, he conducted Leonard Bernstein’s The Mass for Pope John Paul II at the Vatican. In 1988, Boris was awarded the Officer of the Order of Canada, Canada’s highest civic honor. That same year, he was awarded an Honorary Doctorate of Law at McMaster University. Two years later, he was made a Knight of Malta. In 1992, he was selected International Man of the Year by the International Biographical Center in Cambridge, England. In 1996, he was elected a Fellow of the Royal Society of Arts of Great Britain. In 2006, he was appointed to the Order of Ontario. Besides numerous film and radio commitments, Mr. Brott has conducted, produced, and and hosted over 100 television programs on both sides of the Atlantic. He has recorded for CBC, Septre-Mace, Mercury, Pro-Arte Records and Sony Classical where CDs with the late Glenn Gould have been released. He lives in Hamilton, Ontario, with his wife, Ardyth, who is an author and lawyer. The Brotts have three children and two dogs. Thousands of people across corporate America have heard Boris Brott’s interactive presentation — he draws comparisons between business organizations and symphony orchestras. Both have common goals, each must perform in harmony to achieve those goals, and each continually strives for perfection. Often, both attempt to be innovative and creative. Boris draws out the juxtaposition of teamwork and leadership the need for creativity within an organization; the joy of communication and the achievement of success. All are explored through the medium of music. Boris instructs the audience to reach under their chairs where they will find a tonebar — a musical instrument with a mallet. The audience has been divided into five specific notes. After “rehearsing” and enjoying the levity and excitement, the audience is prepared to play Beethoven’s Ode to Joy. Boris turns to the video screen, gives a signal, and a full symphony orchestra begins to play. At the appropriate point, he turns to the audience and “conducts” them in this informative, educational, and fun-filled presentation. The audience is thrilled to be playing a significant part and to make music under the direction of a symphony conductor. Audiences and corporate executives find it a memorable and unique presentation. • A live orchestra joins Boris on stage. Musicians and their instruments are introduced. A short musical example is played. The is repeated until an 11-piece orchestra is formed on stage. • The meeting’s host joins Boris in conducting the audience and/or explaining the similarities between their organization and a symphony orchestra. • Each script is tailored to suit the meeting’s theme or message. • Specific concepts germane to the organization are brought out in the script. • The presentation’s length is suited to the requirements of program. • Mr. Brott can act as host through the duration of the meeting. Creativity rests in all our souls. This presentation demonstrates five steps that are at the heart of every creative process. Boris interacts with “Professor Siegfried” on screen, and together they take the audience through the steps necessary to concoct anything from E=MC2 to an enlightened business plan to the perfect Christmas party. This is an interactive presentation involving the meeting’s host as well as the audience. But the heart of the piece rests with Boris and Professor Siegfried taking the steps necessary to “light the creative flame.” After each step, Boris “conducts” the audience playing their tone bars, and concludes his presentation with a roaring rendition of the music from Star Wars.